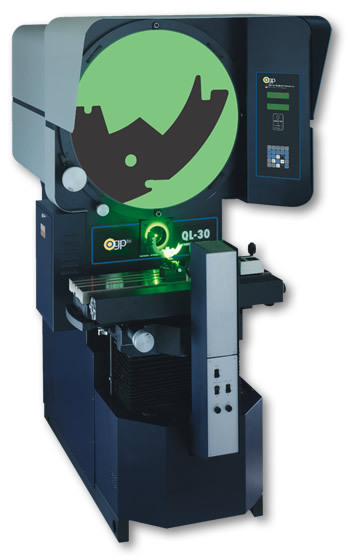 QL-30 Contour Projector - CMM Inc.
Only 4" wider than the QL-20, the QL-30 is ergonomically designed and offers the most compact footprint of any 30" in-line comparator. It also delivers a fully corrected image, near zero distortion, and superb image contrast. The QL-30 has a large 30" viewable screen – over 4.5 times the image area of 14" systems. Its in-line design is also well suited for applications that require frequent part manipulation. The constant working distance projection lenses will image large parts, even at high magnification. Furthermore, the QL-30’s heavy-duty cast iron/nickel-plated worktable supports up to 550 lb (250 kg), while the DC servo motor drive provides fast part translation. Controls are located at natural positions for fatigue-free operation, and the screen has unparalleled brightness with digital readouts located at eye level.